Greetings all! Continued wishes for a Happy Easter!! By request (prevoked, I'm guessing, by the curious photo and post I put on FB after preaching Easter Sunday), here is my sermon for that day. I'm thrilled that because Easter this year fell on April 1, there was many a preacher and many a sermon that I'm sure explored the comic elements of this most sacred day of the Christian year and, hence, the Way of Christian Discipleship. Here's my addition to that august (and April!) body. Ha ha ha! Well, once again Happy Easter everyone! And you also know what big holiday falls on this day today…. [Congregation responds] "April Fools Day! " 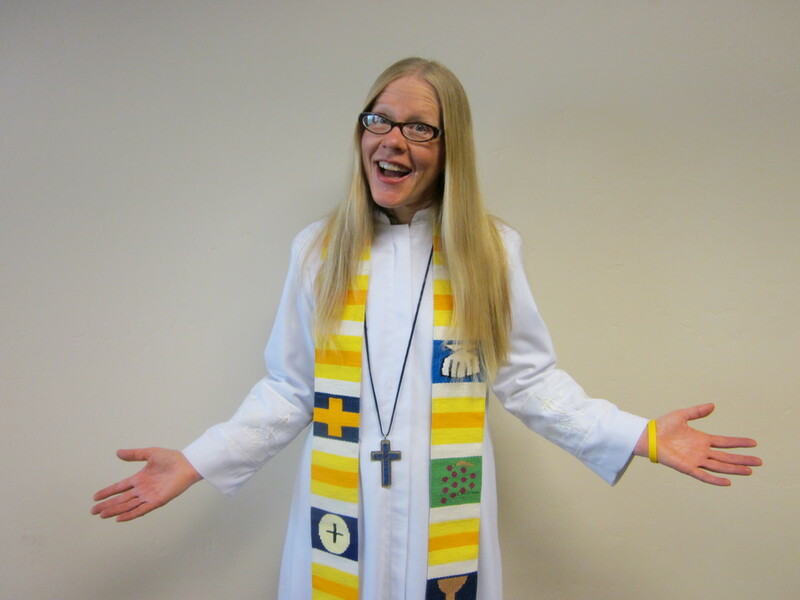 That’s right, and I’m sure you are quaking in your Easter boots wondering what that means for worship today….Has the pastor planted a whoopee cushion under any of the pew cushions? Has she put hot sauce in the communion wine? Has she told everyone but you that the Lord’s Prayer today will substitute “debts” for “tresspasses” and we’re all going to listen for when YOU screw it up! HA HA HA! No, we won’t be doing anything like that, but the fortuitous coincidence of these two special celebrations falling on the same day means we can and should enjoy Easter with more than a small dose of foolishness, so I’d like to share with all of you this! [ Pastor gets out Jesus-in-the-Box] What is it? Can anyone guess? The perfect way to tell the story of Easter and use your leftover craft felt, too! All good! Let’s take a moment and let the Jesus-in-the-Box bring the story of Easter to Janesville! [Pastor puts Jesus back in the box and closes the lid as she talks.] It all started on Good Friday, when Jesus was crucified on the cross. It was such a sad day, and then Jesus was taken from the cross, put in the tomb, and a stone was rolled over the entrance, sealing it completely. [Hold up now-closed box.] Jesus had promised he would return in three days to prove death doesn’t have the last word and the love he’d shared would never end, but his friends couldn’t remember that. They cried and cried wondering if they’d ever be happy again. If they’d ever feel so loved again, and healed. If there was anything of Jesus that would ever be worth sharing with others because now he was gone. They thought they better just move back into their daily lives…but God didn’t think that. [Start turning the crank.] God was at work during that time when up on earth there was nothing but darkness and silence and tears. God was stirring Jesus back to life, raising him up up up until on Sunday morning three days later….POP! There he is! Alleluia!! And he told his friends to spread the good news that He Lives! Shout for joy! Sing it to the heavens! But three days later, what do ya know….Pop! Up comes Jesus!! Jesus-in-the-Box is such a fun, and theologically correct way to share the Easter story, don’t you think? 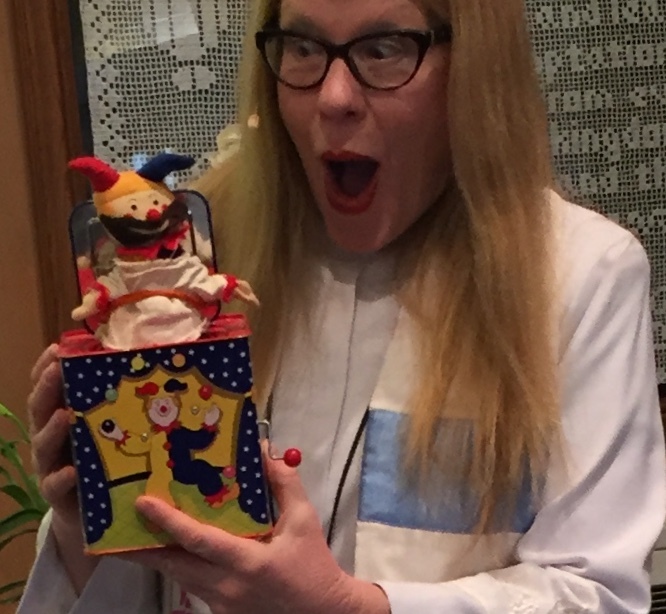 Especially the way it can’t help but engender delightful surprise and joy when Jesus pops out of the box! Er, tomb! Just the way God always wanted it! Another thing to love about the Jesus-in-the-Box is that it reminds us Jesus is always going to pop back up! In fact, that’s what’s the most fun thing when you were kid with your Jack-in-the-Box…you’d want to do it over and over and over again…sometimes fast, sometimes slow, but he never fails to pop up! Of course, this means that the Jesus-in-the-Box isn’t true-blue April Fools equipment, because April Fool’s pranks are all about having your expectations undercut, getting the wool pulled over your eyes, and laughing despite your disappointment. For example, if the way this thing worked was that you’d start cranking and singing…”Jesus died upon the cross he said he’d never leave us.…" [Sudden silence. Beat.] April Fools! Or, “... and three days later what do ya know…Pop! Up comes Dennis Rodman!” April Fools! No, what we love about our Jesus-in-the-Box is that the game of it is never if, or who, but when! Always when! Unfortunately, even though the Iron Age had already come, folks in biblical times had not yet invented the Jesus-in-the-Box, so they didn’t have this super-helpful reminder that indeed, Jesus would be rising again after three days, just as he’d told them...and told them and told them. And, unfortunately, in each and every gospel account of Jesus’ resurrection, no one seems to remember this promise. Everyone has a lot of trouble understanding what’s going on, let alone finding anything about it surprisingly delightful. In fact they act as if Jesus' reappearance is some kind of April Fools prank. Or worse. In our gospel lesson from Mark it’s all pretty bad. Things start with the women coming to the tomb in the earliest part of the day. They’ve brought spices to anoint Jesus’ dead body, which is a good and proper thing to do. But they signal from the first they doubt even that’s going to happen. “But who will roll the stone away?” they ask. They sound cranky and cynical. They probably haven’t slept much since Friday and have been crying and agitated and for any number of reasons don’t want to have to be doing this right now. And they're clearly NOT thinking anything the least bit funny might be on its way…not even a "gotcha" prank. When you’re dead you’re dead and that’s it. It’s like being in the state of mind on April Fools that the sugar bowl will always only contain sugar and the salt shaker will always contain only salt. Sugar and salt never never can, nor ever will be, switched. The ladies then arrive at the tomb…and the stone is already rolled away! Whaat? And they walk into the tomb…and it’s EMPTY, except for a strange man in dazzling white clothes! Is he…a ghost? This eery figure tells them that Jesus has risen and will meet them in Galilee. You can bet these poor, tired, despodent women can only at this point imagine what Jesus looked like the last time they saw him - battered and bloodied and hanging from a cross - and that’s what they imagine they will see when they encounter him…a veritable zombie! This isn’t Easter, this isn’t April Fools, it’s HALLOWEEN! So, even though the man in white tells them to go tell the other disciples this really good news that he has risen just as he promised, all these women do, Mark tells us, is run out of the tomb so filled with fear they do nothing but keep there mouths shut and don’t tell a soul. The End! April Fools!! Ha ha ha!! APRIL FOOLS! That’s what Mark seems to be saying to us anyway as his gospel abruptly ends! We readers are thinking he's the one pulling some kind of prank! 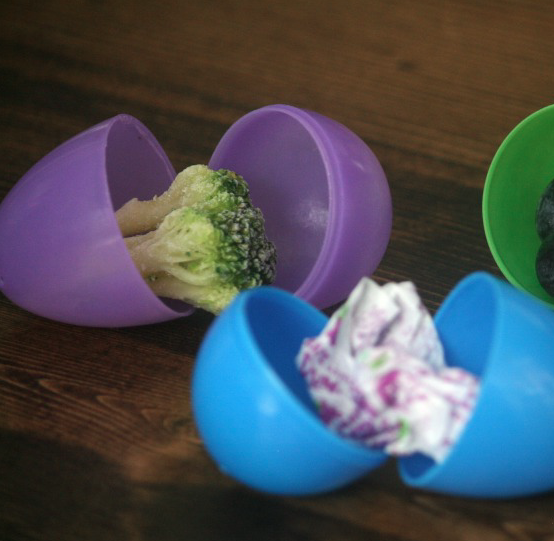 Like opening up a plastic egg to find it's filled with...vegetables! (That’s one of the Easter April Fools jokes recommended online.) Ha ha ha! This is impossibly wrong! 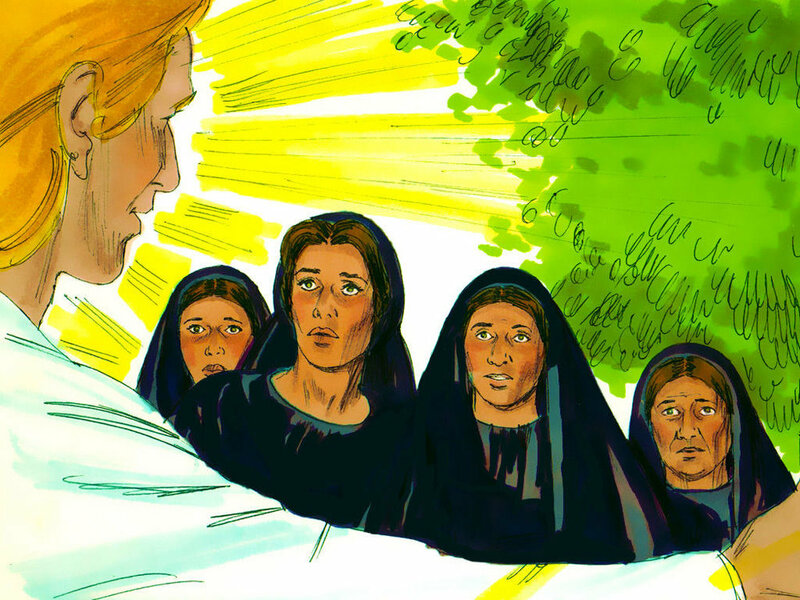 How can the women run out and not telling anyone Jesus has risen? How in the world could there be a church today if no one told anyone what had happened? Well, the joke is sort of on us, we who assume somehow it ended up all hunky dory because the women must have at some point changed their minds and started spilling beans. The several tidy endings of Mark's gospel that were tacked on later, suggesting the women finally did get with the program and everyone lived happily ever after, suggest as much. But chances are great Mark didn't want a fool-free ending to his Easter account. And, of course, because there was no Jesus-in-the-Box to remind anyone that indeed Jesus would be rising (just as he'd promised), how in the world did the word get out, and why in the world was it believed? Mark doesn't give us a clue. I have a couple of theories to suggest. One, Mark is subtly suggesting that although the women at the tomb were unable to follow through, there were people who did tell the disciples and began telling the world that Jesus indeed had risen as he’d promised. Throughout Mark's gospel those in his inner circle who should "get it" never do; however, unnamed, unimportant, poor peripheral characters often provide Jesus examples of faithful living. I'm guessing it was from among these folks on the margins that word started to get out. After all, when you live "outside the box" you are able to better think and imagine possibilities outside the box as well (pun totally intended!). And certainly resurrection from the cross was an outside the box idea (pun again t.i.)! Here just might be another great example of how God is always working through surprising, least-likely messengers. Don’t ever underestimate the sacred potential of anyone. And besides no eggs, the Grim Reaper greets the kiddies instead!! Ha ha ha! God needed to find another way to get His people to believe, really believe, not only that Jesus had risen but, more importantly, that this is the way He always operates….bringing life up out of death, out of the ashes, out of what seems impossible to ever have a future. With God it’s always up up up! Even when it makes absolutely no sense. God brought the Holy Spirit into the world to help people see sacred workings in a new light; see how new life was rising up in all sorts of ways and impossibly dead places. When people witness or hear about or remember experiences of "resurrection" in their lives and their world they would know, and really accept, that rising from the cross was indeed possible. Was true! One of the things we are invited to do, and we really should do, especially on this day of Easter and throughout these next 50 days of Eastertide, is look for, remember, and celebrate stories of resurrected new life we've witnessed, we've read about, we recall from your own life. Stories we savor over and over again, like when the Jesus-in-the-Box pops up and pops up and pos up yet again. Here are a couple of special Easter resurrection stories I am savoring today. The first is about Detroit. A city that for all intents and purposes is a dead town, right? Okay, the downtown has had a resurgence, the but poor neighborhoods remain a horrible, unmitigable blight. Timothy Paule, a local photographer and Nicole Lindsey a staff worker for a local health care provider, were a couple who wondered if there was anything they could possibly do for this city that was the home that they loved. And then Timothy got a bad cold. He couldn’t seem to whip it, until one day when he was at the drug store picking up a new prescription that might do the trick, the guy at the counter suggested he start using local honey. Not the kind that’s treated for mass production and shipped from afar - but something produced locally because it contains medicinal properties that just might help. And it did! And it got Timothy and Nicole thinking….there are so many empty abandoned lots in the poor areas of Detroit, lots that are presently only producing ragweed that make life even more miserable for those poor neighbors with allergies and asthema. Maybe, was it possible, to start turning these noxious lots into bee farms? Timothy and Nicole contacted a non-profit Detroit Land Bank where you can buy such abandoned properties for a song, and, after purchase and some training, started “Detroit Hives”, a company that produces local honey and employs folks from the neighborhood where the hive is located. DH also invites school kids to tour and learn how beehives operate and how to harvest honey. The neighbors love the new life the bee farm brings to their block, and plans are now afloat to open new hives and bring new life and hope in so many ways to places in Detroit that have been heretofore assumed to breed nothing but death. Alleluia! When I finished that paragraph my heart, mind and soul completely transformed. I realized beyond a doubt that my gifts for comedy and laughter, like Gilda's and Bob's, could be - were being - called to somewhere where they were greatly needed: for me, it was the church. That’s way more important than making it in show business, the obvious place where funny people find themselves. Yes yes yes! I now arose both literally and figuratively, glad to share the good news about the awesomely exciting new life I'd be pursuing and sharing. You definitely get the feeling that Gilda feels her life ended in failure. Her cancer wasn’t cured, her battle wasn't won. But I want to say to Gilda now, wherever she is, it’s because of you and your journey that I sprung to new life and have helped others do the same. Same for Bob the radiation technician, wherever he is, you can’t even begin to know what your witness has meant to me and to so many. We really can never know how our lives touch others and -- with the God of Never-ending Resurrection always in the mix -- how we will bring resurrection into to the world. Who knows what’s next for and through us, any of us, all of us?? [Pick up Jesus-in-the-Box and start cranking it one more time.] Let us all ponder this awesome reality of life, life with our wonderful God, and open ourselves ever more to all of its possibilities as we today sing each and every "Alleluia" and "Pop! Up comes…" [in the silence, audience fills it in:] “Jesus!” [Pastor says] No, DEBTS! [Pause] No, I’m kidding, it’s Jesus! April Fools!!! AMEN!! !